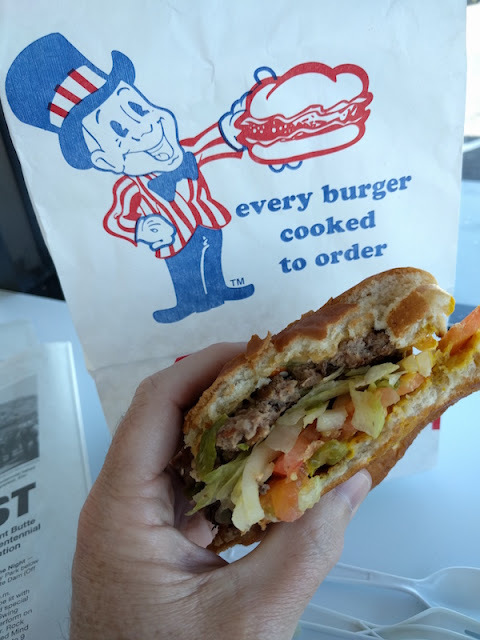 I'm in New Mexico on the trail of the Green Chile Cheese Burger, and today I stopped at one of the many Blake's Lotaburgers in New Mexico. And what a tasty burger it turned out to be. 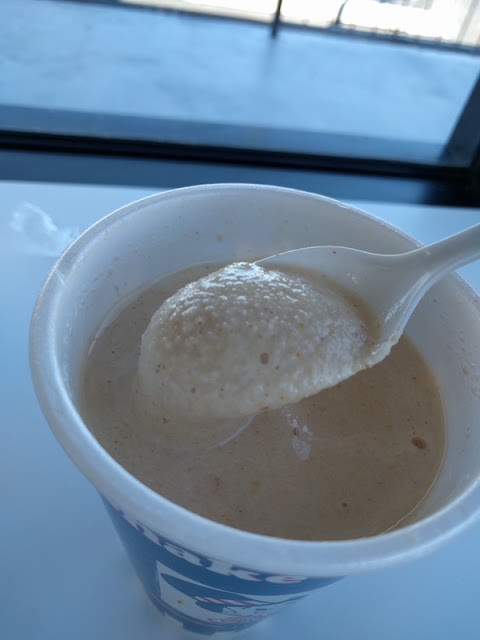 But there was also the pumpkin pie shake, so read my review with more pictures after the jump. I showed up for the green chile cheeseburger, but quickly noticed the seasonal special: Pumpkin Pie Milkshake. This is an actual slice of pumpkin pie mixed into a shake. Sound good? Um, yes! It's served with a straw AND a spoon so you can scoop up the pieces of pie crust at the bottom. I ended up eating the whole drink with the spoon and never touched the straw. This is really excellent. There's plenty of cinnamon, and the pumpkin pie tastes very fresh. I loved it, and ate most of it before I touched my grub. The shake was still cold when I got it which makes me think the pie was already chilled, because it didn't warm up and melt the shake. This was really an excellent treat! I'm glad I was here in October. The chili (not to be confused with chile) is also really good. It's much spicier than the green chile cheeseburger. 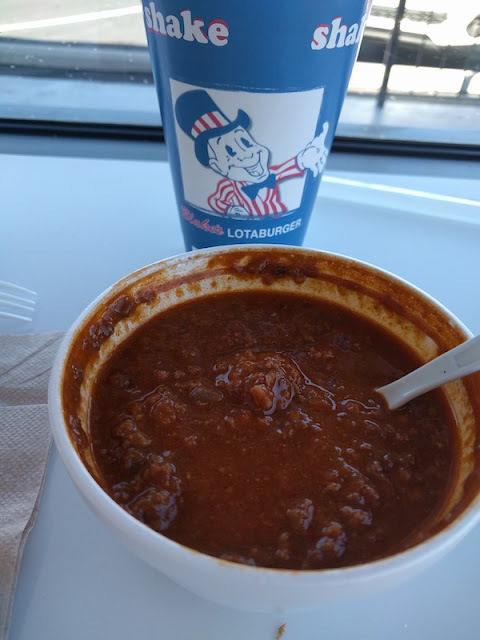 This is as good as the chili you would make at home or get at a restaurant, and nothing like what you find at other fast food places. It's filled with meat, spicy, and it's not oily or greasy. There are plenty of Blake's throughout New Mexico, and I ended up at what looks like the Blake's HQ. 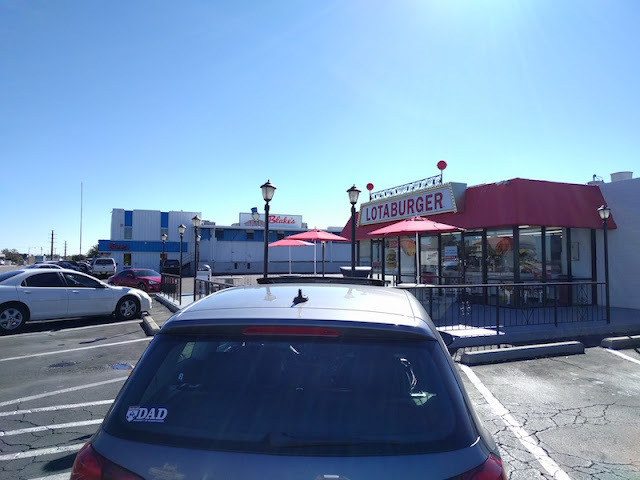 This location only has a few seats inside, with more tables outside. It is super clean (like every Blake's I've been to) and the staff was really friendly. Blake's Lotaburger is on the New Mexico Tourism Green Chile Cheeseburger site. There's many more green chile cheeseburgers there to check out. And Blake's is #1 on the USA Today's 2016 10Best list of Green Chile Cheeseburgers. TIP! Blake's Lotaburger is closed on Sundays. Check their hours and find more locations at the Blake's Lotaburger web site.